Knife crime may be in the news now, but it’s been a reality on our streets for years. Recently PCSO Richard Whelan and his colleague PC Christian Sewell decided it was time to do a bit more about this growing problem, in their home town of Hull. In 2018 the pair started an educational and awareness-raising campaign, #NoMoreKnives, to try and reduce the amount of knife crime in the East Yorkshire town. In their first year of campaigning, they visited every secondary school in Hull to talk to pupils about the dangers of knife crime. Then, this March, they completed a weekend of showcase events aimed at head teachers and other professionals involved in education and youth intervention. And now they plan to take the campaign beyond the city of Hull. #NoMoreKnives is one of three youth intervention programmes to receive a share of £333,000 of Home Office funding that will allow it to be rolled out across Humberside. From 1 May, Richard, who’s also a UNISON rep, and Christian will take the #NoMoreKnives message to 55 secondary schools, 15 colleges, 12 pupil referral units and some smaller children’s homes across North and North East Lincolnshire and East Yorkshire. “We anticipate that, once we have completed the second phase, we will have reached over 60,000 young people across Humberside, spreading the anti-knife crime message,” said Richard. It’s difficult for the campaigning PCSO and PC to assess the exact impact of their work. But Richard says that schools have picked up the baton and are now doing projects themselves. And then there is the anecdotal feedback, like the email received from a young person saying that they’d carried a knife for some time – ‘for defence’ – but after a school visit from Richard and Christian had thrown it in a lake and was committed to never carrying one again. The House of Commons Library reports that there were around 40,100 (selected) offences involving a knife or sharp instrument in England and Wales in the year to March 2018. In 2017/18 there were 268 homicides recorded using a sharp instrument, including knives and broken bottles, accounting for 33% of all homicides – an increase from the 216 recorded in 2016/17. While this is promising progress, Richard is keen to point out that austerity remains part of the ongoing problem. 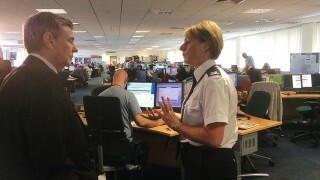 “Cuts to police staff have reduced our force’s capability to engage in educational support in schools,” he says. 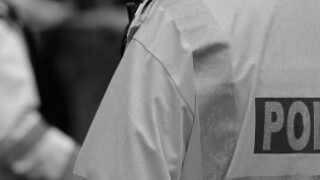 “Since 2010 we have lost the equivalent of 150 PCSO posts. “Some have taken up roles as police officers and others have left the service and will not be replaced. “Cuts in funding to youth services also mean schools have not been able to finance projects like this, so this additional funding [from the Home Office] is allowing us to provide much-needed support to schools across our county. 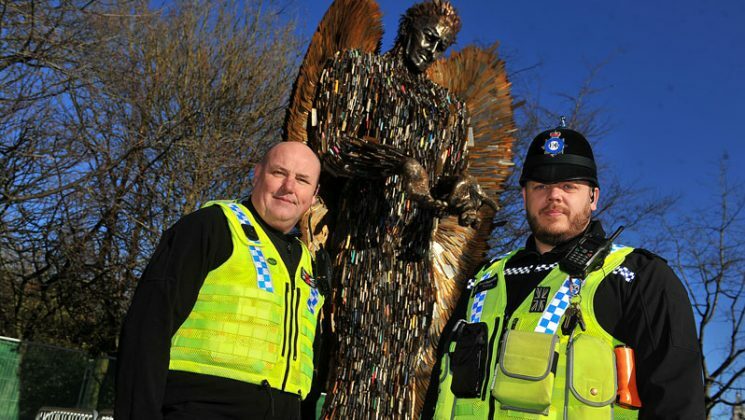 Earlier this year the #NoMoreKnives campaign brought the acclaimed ‘Knife Angel’ to Hull. 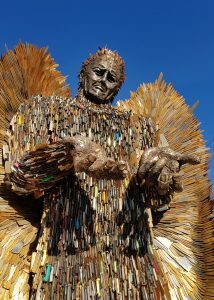 More than 50,000 people visited the 27-foot sculpture, which is created from 100,000 confiscated knives. 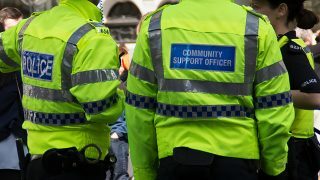 UNISON’s Humberside Police Staff branch made a financial donation to the campaign’s initial launch project, allowing it to get off the ground. Richard says that working in partnership with their local media, Viking FM and The Hull Daily Mail, then allowed them to spread their message “far and wide”. In March the project won the Sky News independent radio news award for campaigning journalism, while Richard and Christian have also been recognised with an Excellence in Policing award for extraordinary police service. Richard also received a certificate of appreciation from the UNISON branch at its recent AGM, for his work around knife crime. He’s proud of the union’s work. “UNISON’s campaign against police cuts has allowed us to showcase the vital work PCSOs and police staff carry out in relation to making our schools safer places – and supporting vital youth intervention work within our communities. “If it was not for the work of our police staff and our Labour police and crime commissioner Keith Hunter and his team of support staff, this emerging national issue may have gone unchecked in the Humberside area.